See other tutorials on our Knowledge Base! FIBARO Home Center 2 is designed for commercial or larger premises where you may need to link multiple units together in a network for controlling in a wide area. LUA Programming – LUA is a programming (scripting) language commonly used in home automation controllers to enable users to create more complex control scenes than supported by the controller’s Scene editor. Home Center 2 can work as a Master and perfectly meets requirements designed for this purpose. 1. Unscrew the left side panel. 2. Take the side panel off. 3. Connect the LAN cable and the power supply. 4. 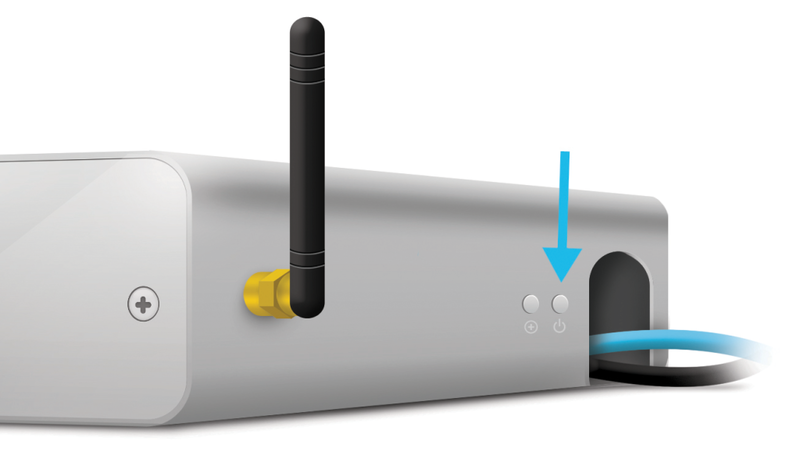 Connect the power supply to the mains, and the LAN cable to LAN socket in your router (Home Center 2 requires an outside router). 5. Start HC2 with a POWER button and wait approx. 2 minutes for the device to start. 6. 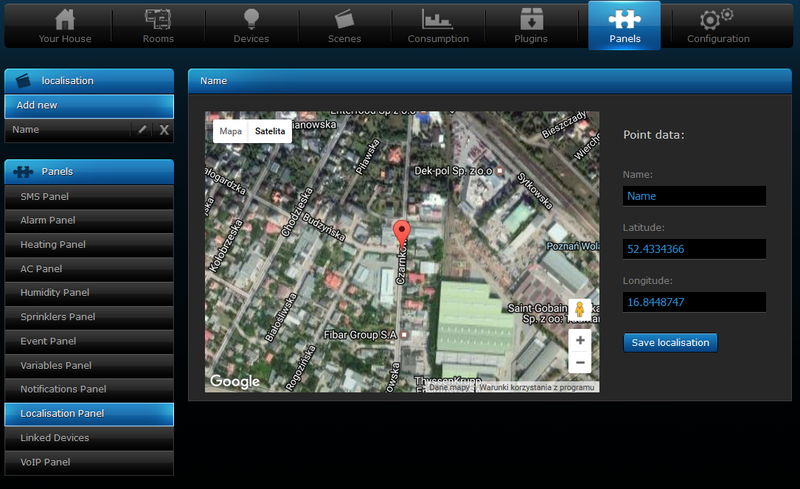 Download and install FIBARO Finder designed for your operating system. 7. Start the FIBARO Finder and click “Refresh”, choose the one you wish to connect and click “Connect“. 8. After successful connection you will access HC2 Login Panel. 1. After successful connection you will access HC2 Login Panel. 3. 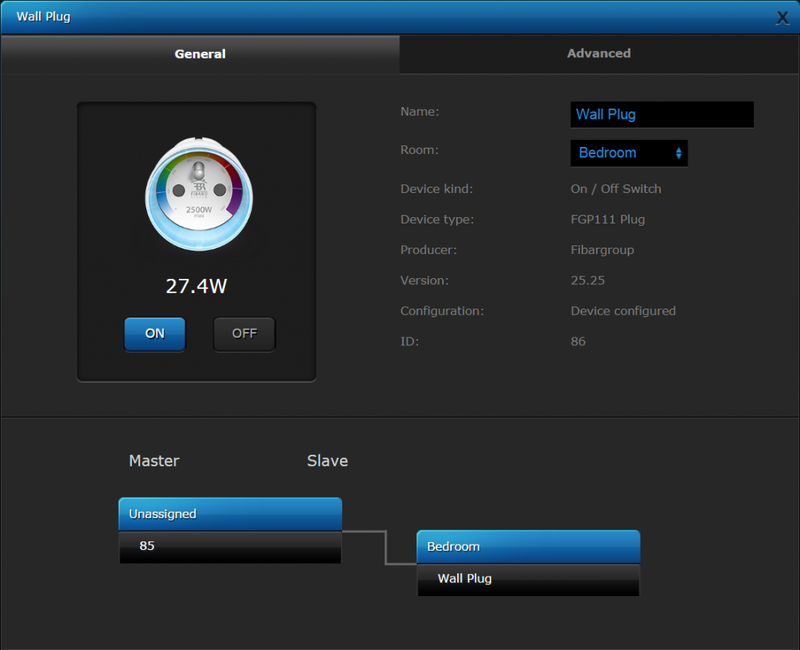 Click Log in – now you can operate your home automation system. The Rooms section is designed to manage your house divided into sections and rooms. 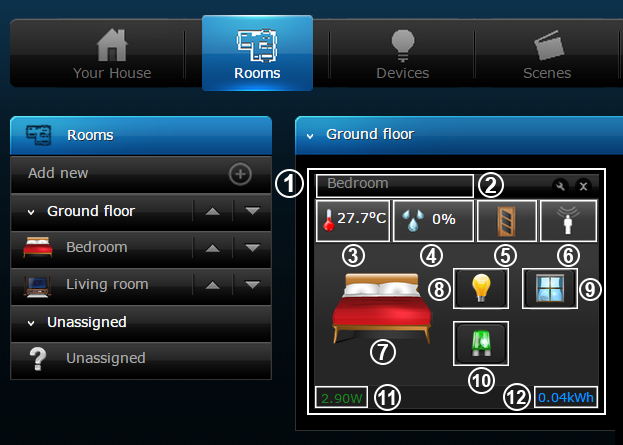 You can easily add, rename, change the order of the rooms, assign them to each of section or add new sections. Turn on/off the lights button. Adding new device to your system is a fast and simple process. 1) Press the “Add or remove device” button in the “Devices” section. 2) Press the “Add” button to put the main controller into learning mode. The duration of the learning mode can be adjusted here by changing the value (30 seconds by default). 3) Home Center is waiting for adding the device. 4) Put your Z-Wave device into the adding mode according to its manual. 5) Home Center will start the inclusion process and device configuration. If process have not started even after few tries, try deleting the device according to “Deleting a Z-Wave device” article. 6) Successful inclusion and configuration will be confirmed by “Device configuration finished” message. The Home Center has over 130 available plugins for different cameras. For this example we will be using an Axis IP Dome camera. 1) Click on the Plugins tab at the top and then Available on the left hand bar. 2) Once we have located a suitable plugin, click Install which takes us into the details of the Plugin. 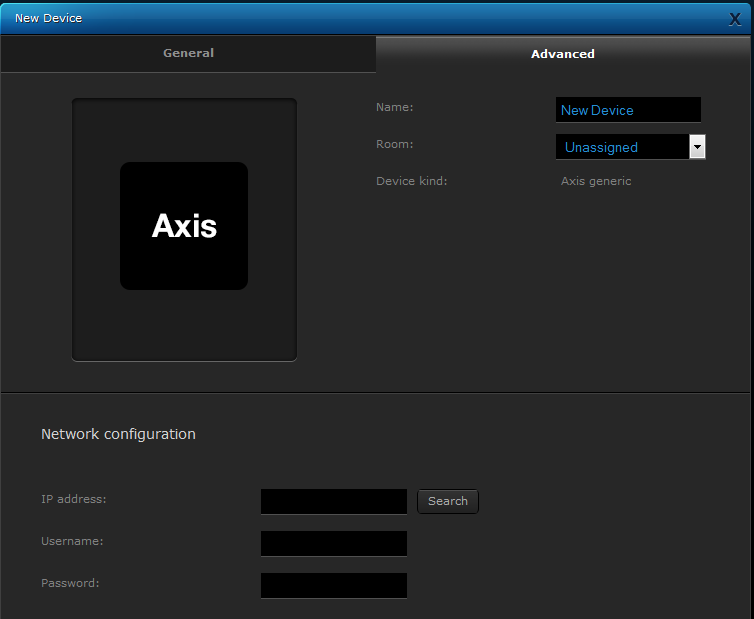 In this article we will install Axis IP Camera. 3) Click Free to download and install the plugin. 4) After we have selected the Plugin, downloaded and installed it, an Add button will appear underneath the description. 5) Click on the Advanced tab and fill in the IP Address, username and password. Other fields will be filled automatically. 6) Click the blue save button on the right hand side. The camera will be added to the system. 1) To add an IP camera manually, click on the Devices tab and then Add or remove device on the left hand side. 2) As all the general settings are also available on the Advanced tab, click Advanced now. 3) Name the camera and give it a room. 4) Using the drop down box for Camera Model we will check to see if ours is there. If it is, clicking on it will automatically fill in some paths in the fields below. 5) Enter the username and password associated with the camera (normally found using the software included with the camera). 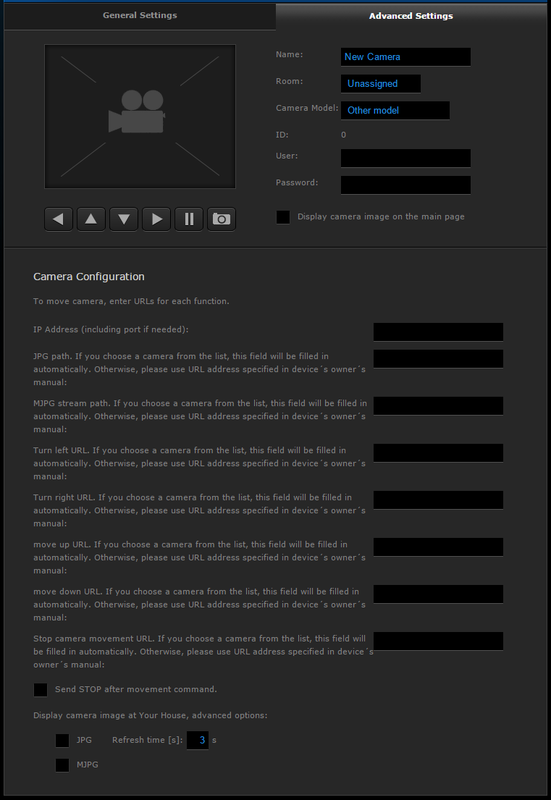 6) Fill out the Camera Configuration: the IP address and stream feeds. All this information should be within the cameras documentation. 7) Click the blue save button on the right hand side. The camera will be added to the system. Virtual devices are designed to control complex devices such as air conditioning units and home appliances via local remote (LAN network). The Fibaro System makes it possible to import existing or create new virtual devices to be controlled by the Home Center interface. 2) Click Add or remove device button located on the left hand side. 3) Use Import virtual device panel to import .vfib file from your hard drive. 4) Fill in the IP Address and TCP Port. 5) Use save icon to save the device configuration. Deleting the device will remove it from the Z-Wave network and from the controller’s memory. The device will be restored to its default settings during this process. 2) Press the “Delete” button to put the main controller into learning mode. 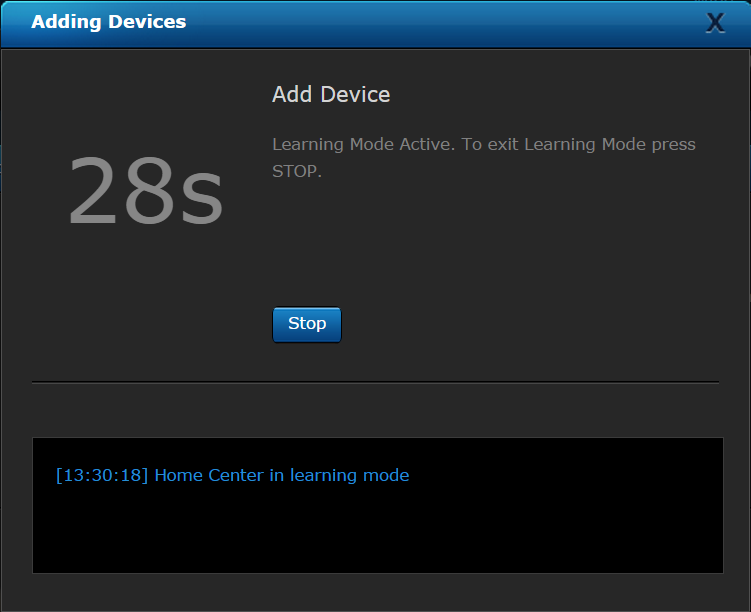 The duration of the learning mode can be adjusted here by changing the value (30 seconds by default). 3) Home Center is waiting for deleting the device. 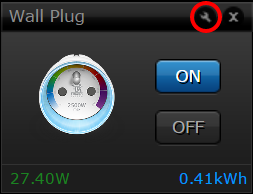 4) Put your Z-Wave device into the exclusion mode according to its manual (triple clicking the B-button, TMP button or S1 switch in case of FIBARO System devices). 5) Home Center will start the process of exclusion and removing from controller’s memory. 6) Successful removal will be confirmed by “Removing devices finished” message. General Settings tab lets the user administrate the device. 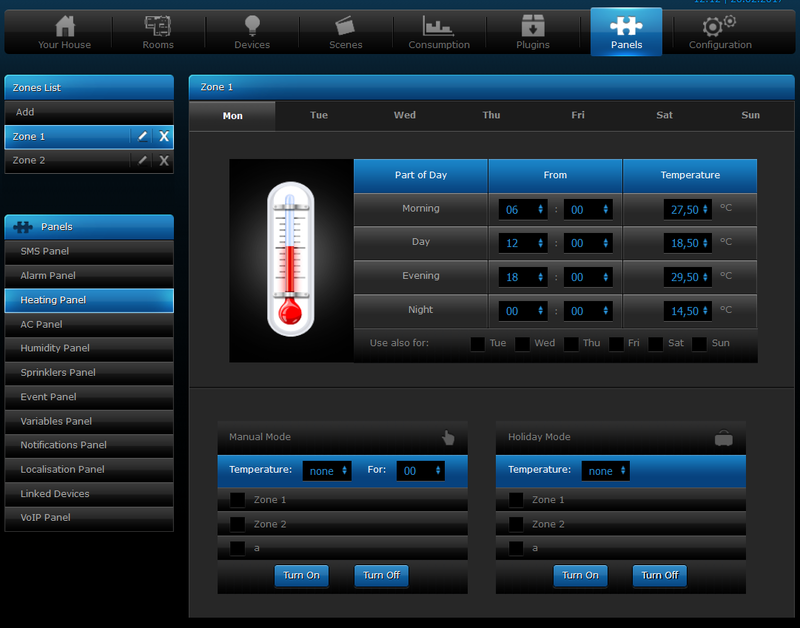 Here you can simply control the device, merge it into groups, change its name and assign it to the right room. You can also change the icon of the device, check the battery’s level and check version of the product. In this section you can see the structure of the device – which endpoints (slave sub-devices) are available under the main device (master). 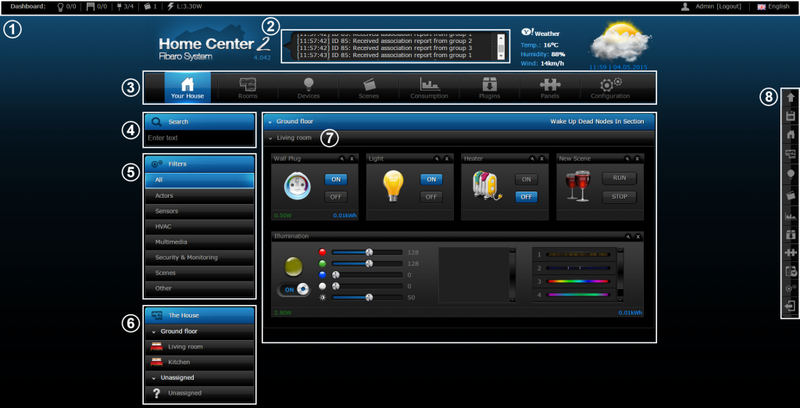 Home Center 2 Configuration interface allows users to modify whole range of advanced settings for every device. 1) Click spanner’s icon to open device options. 2) Select the “Advanced” tab. 3) Advanced configuration will be shown under device information. There are multiple sections of the window. You can also set associations between devices. Association (linking devices) – allows for direct transfer of control commands between Z-Wave network devices. Main controller does not take part in such communication. Using this mechanism, devices may communicate with each other even when the main controller is disabled or damaged e.g. in a fire. 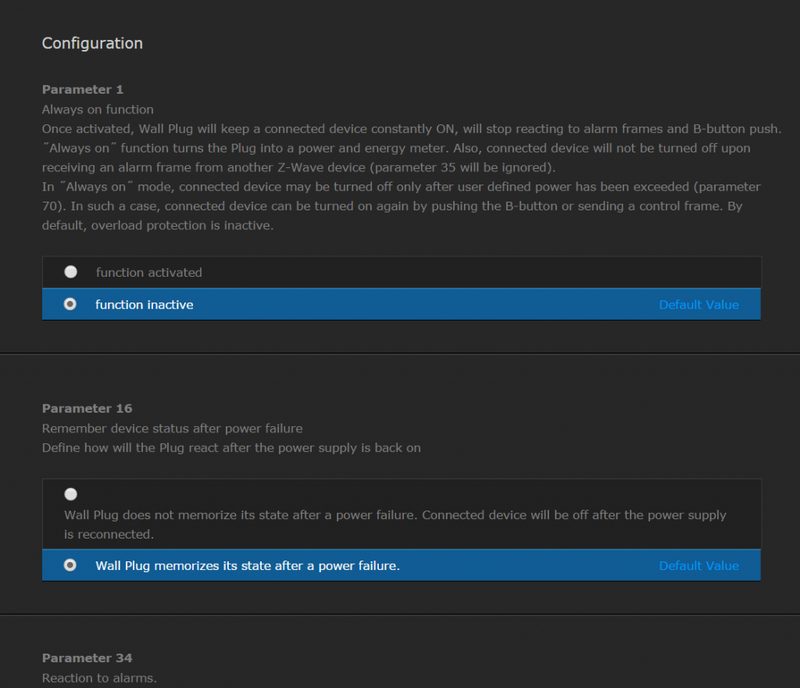 Advanced parameters – allows for customize device's operation to user’s needs. 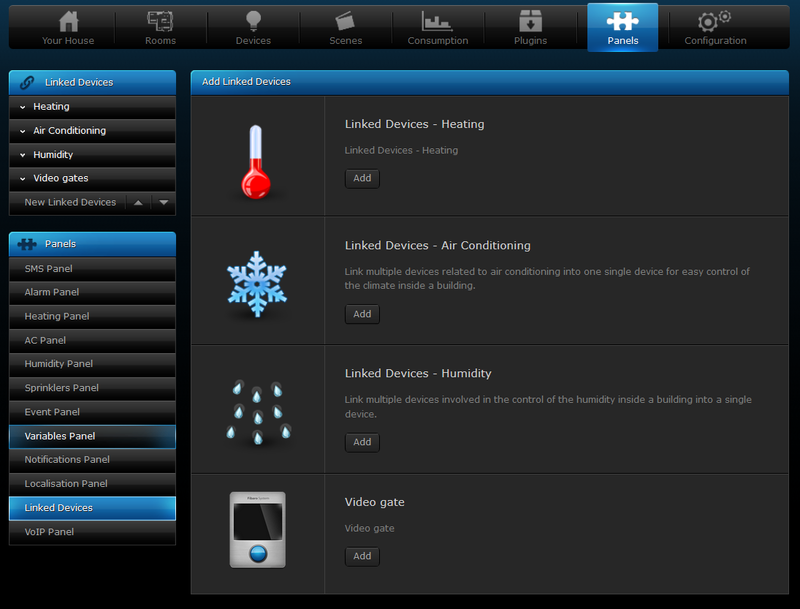 The settings are available in the FIBARO interface as simple options that may be chosen by selecting the appropriate box. Scenes can integrate multiple devices included in your system. Scenes may be initiated by weather condition, a series of intuitive timers or various sensor/module state. You can also trigger a scene directly from the interface of the controller. Magic Scenes – based on one trigger, one action scheme (if trigger appears, then action occurs). The two large boxes at the top show “if” and “then”. The first box is called the trigger. If the event described in that trigger occurs, then your chosen action in the second box will occur. Block Scenes are more powerful than magic scenes and still easy to build. Using number of available customizable blocks (triggers) complex scenes can be visually created.There are five different trigger types: weather, variable, timers, devices and GPS -in five different colors which you can connect in many ways. Lua Scenes are most advanced scenes, which are based on the Lua programming language and require basic programming skills. The Lua scripting language was originally designed for extending the functionality of existing applications, but it is often used as a standalone language. It is very similar to Pascal. 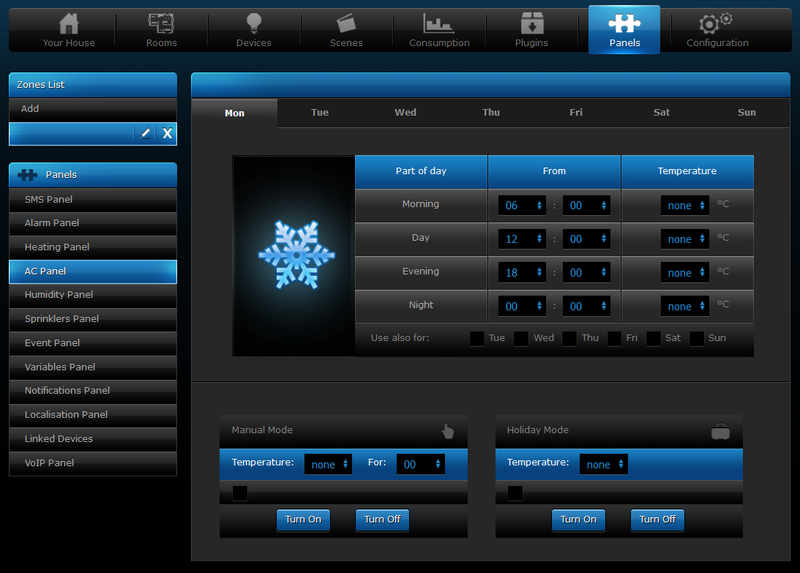 Lua scenes can be very complex and with basic programming skills you can control your home automation at the fullest. 1) Click on the “Scenes” tab. 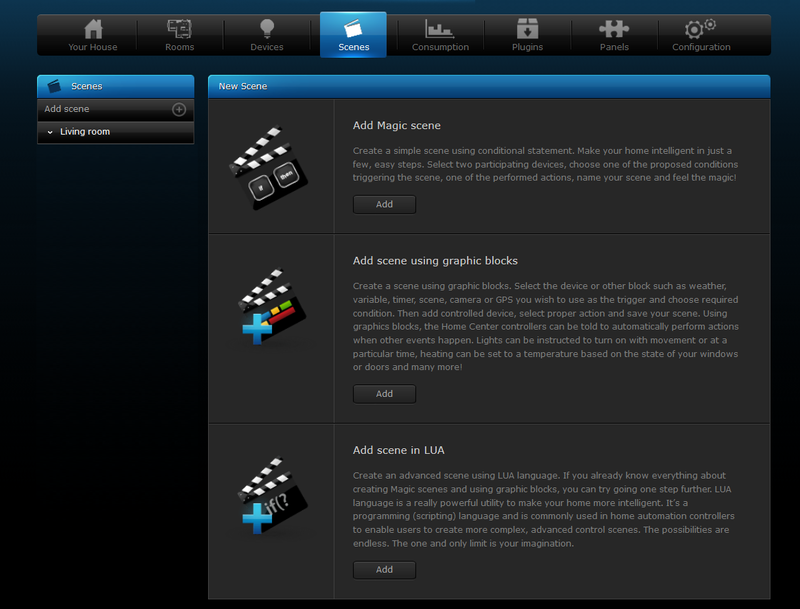 2) Select “Add scene” tab (located in the left toolbar). 3) Choose the type of scene you want to create and click Add. 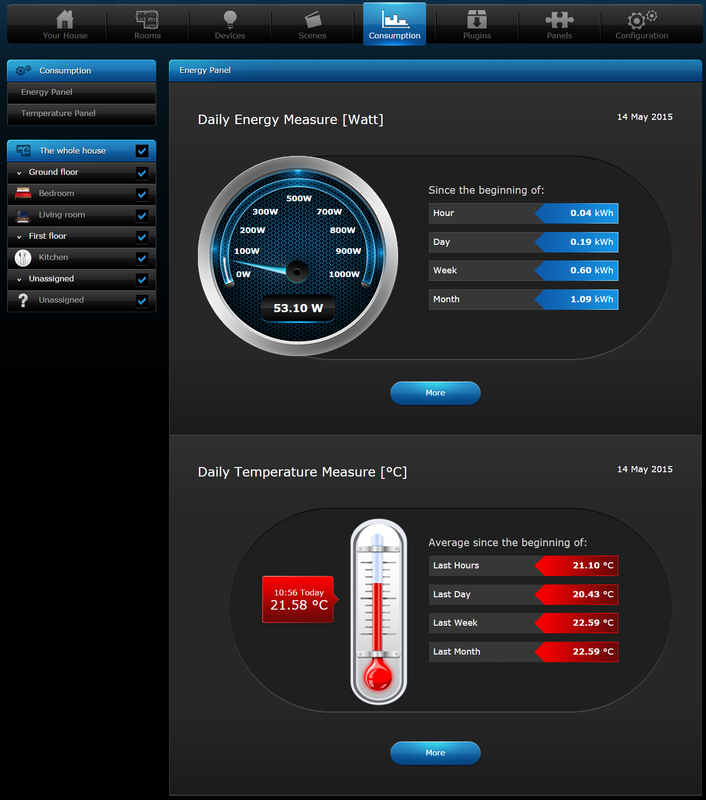 Consumption section of HC2 configuration interface allows for monitoring power consumption and temperature readings from every device connected to the HC2 capable of doing so. Main screen displays gauges with current energy and temperature measures. You can also check summary value of energy consumption in the span of an hour, day, week and month and average value of temperature in last hour, day, week and month. Left hand side panel allows choosing which rooms are taken into the account. Energy panel shows complex information about current and statistical electric energy consumption. First switch allows choosing between rooms and devices view. Second switch allows choosing between summary and comparison view. Third switch allows choosing between displaying consumption in kWh or as cost of energy. Depending on the chosen criteria you can show summary and comparison view of average consumption in the chosen span of time. In the “Settings” tab you can set currency and cost of one kWh of energy in this currency to allow proper energy cost display. Temperature panel shows complex information about current and statistical temperature. First switch (from left) allows choosing between rooms and devices view. Depending on the chosen criteria you can show view of average temperature in the chosen span of time. 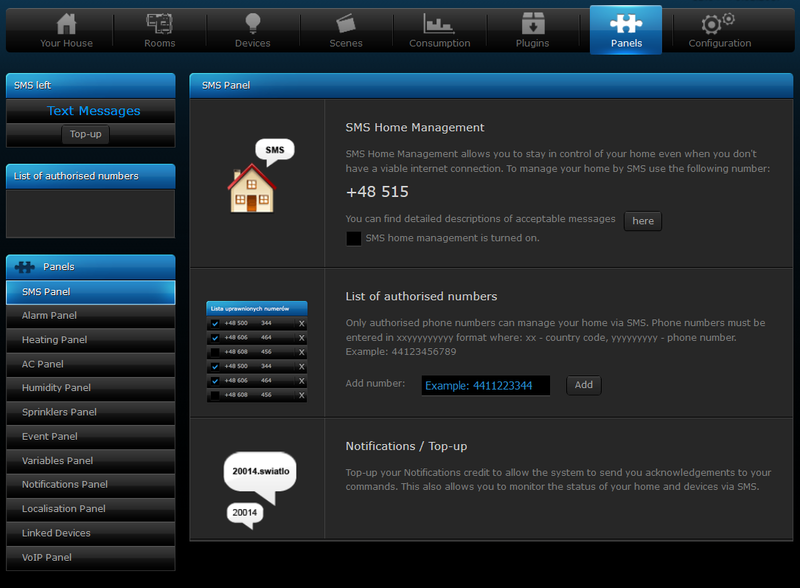 SMS Panel lets you manage your house via text messages when you have no internet access. Functionality is available only in Poland. 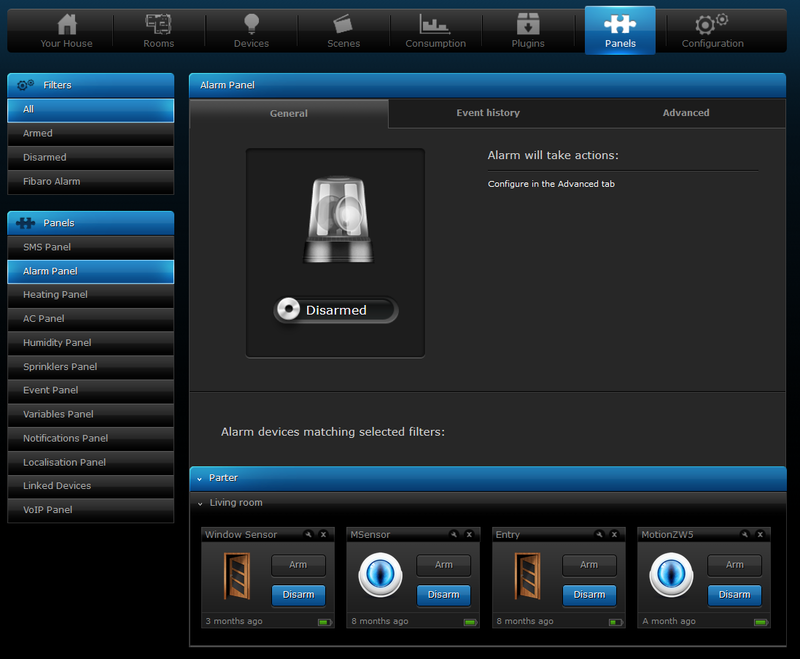 Alarm Panel gives the opportunity to create an alarm with the Z-Wave sensors we already have installed in our home. Heating Panel allows you to schedule heating programs at predetermined times. After the zones have been created and rooms are added to it, all linked devices responsible for maintaining the desired temperature will work in accordance with schedule. AC Panel allows you to schedule cooling programs at predetermined times. After the zones have been created and rooms are added to it, all linked devices responsible for maintaining the desired temperature will work in accordance with schedule. Humidity Panel allows you to schedule humifying programs at predetermined times. After the zones have been created and rooms are added to it, all linked devices responsible for maintaining the desired humidity will work in accordance with schedule. Sprinklers Panel is designed to control sprinkler Relay Switches modules. 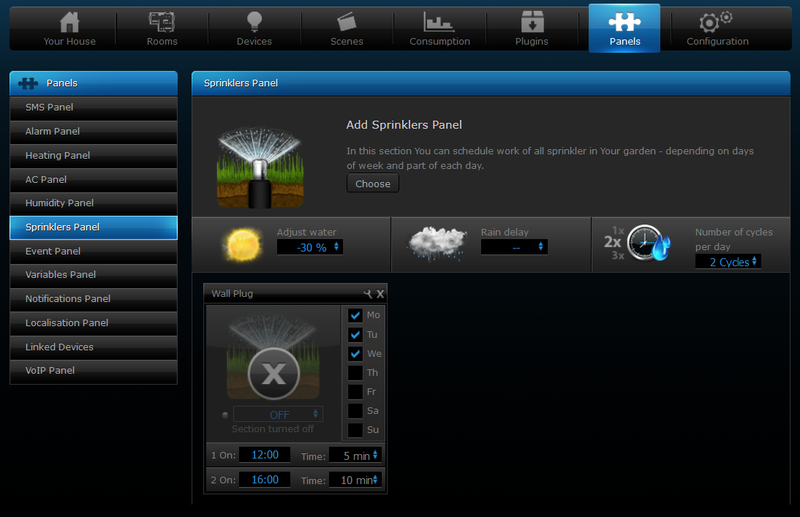 It allows you to create sprinkling schedule or control sprinklers manually. 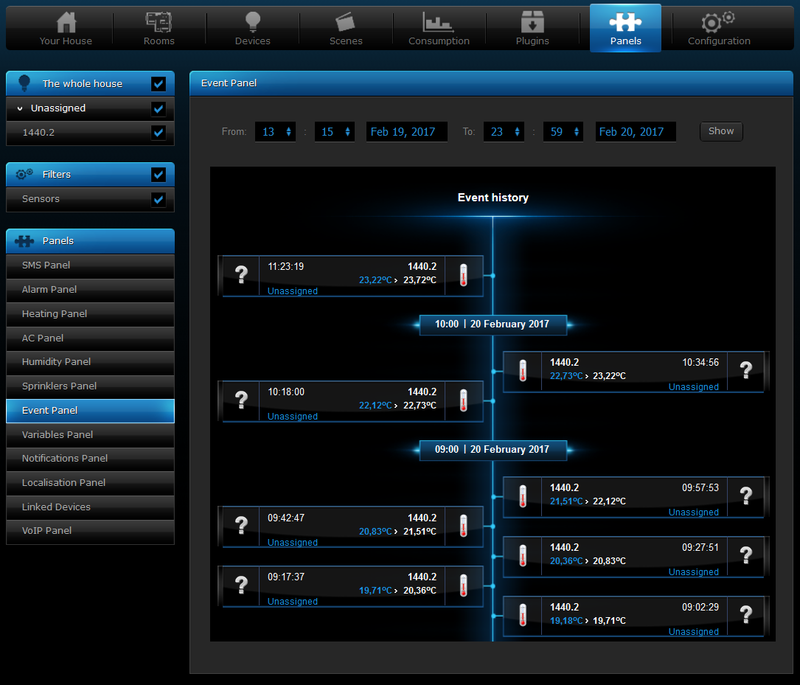 Events Panel is a register of all of the activities taking place in a FIBARO System. 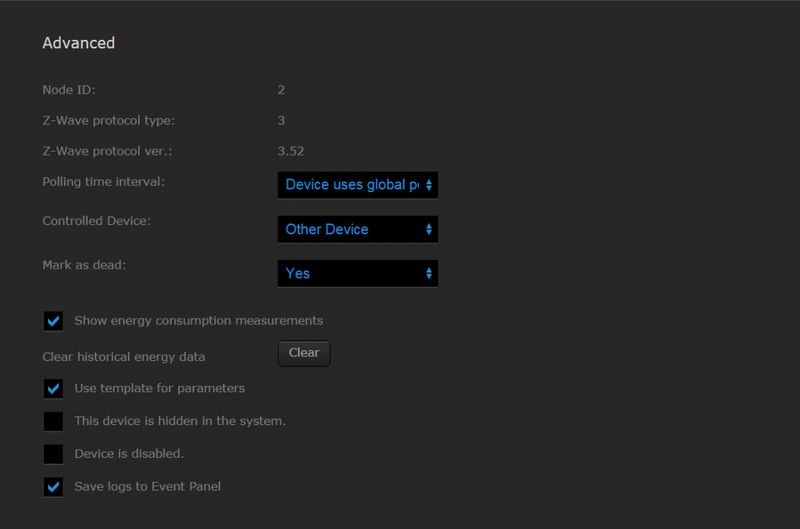 The panel lets the user monitor changes in status of all devices and filter them depending on the device type, location or the time of occuring. 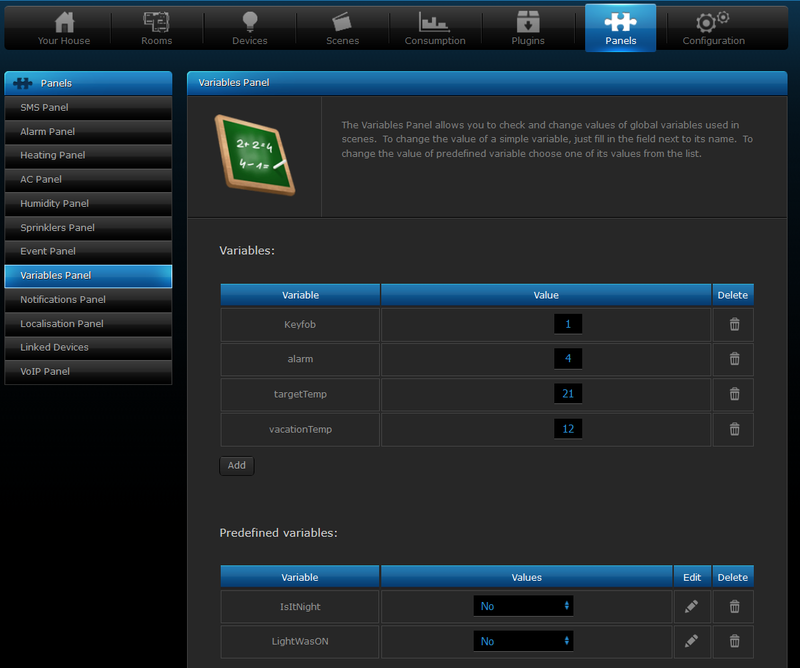 Variables Panel allows you to add, change and check status of global variables that can be used in your scenes. You can use variables that can contain numerical values or predefined variables that can have few states of any kind. Notifications Panel gives the ability to create messages to be used for informing the user of certain events taking place in the house. Localization Panel uses user defined GPS points to activate GPS scenes. There are two ways of defining GPS points: choosing on a map, or entering certain GPS coordinates. Linked Devices combine several devices into one device. Using this function results in controlling the group of related devices as if they were one single device. The group will be presented in the HC2 interface as a single device. 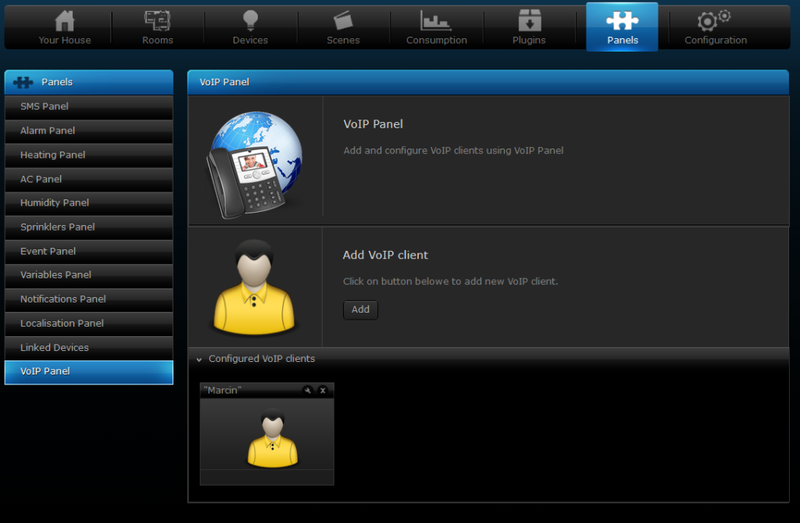 VoIP panel allows to add and configure VoIP clients. General Information window of Configuration section of Home Center 2 provides basic information about your HC gateway, lets you choose main sensors, restart and change language of the interface. Basic information about the Home Center 2 include: serial number, MAC address, current software version, time and date last system backup file was created and server status. The Access Control window allows you to manage the accounts of the users of your Home Center 2. It allows you to grant/block access to the devices, scenes and system settings. From the Access Control it is also possible to grant/block access using the hotel mode for a given mobile application or set a period for reporting GPS locations from a certain mobile device. Also, the Access Control gives an option to define mobile devices which will receive Push Notifications. 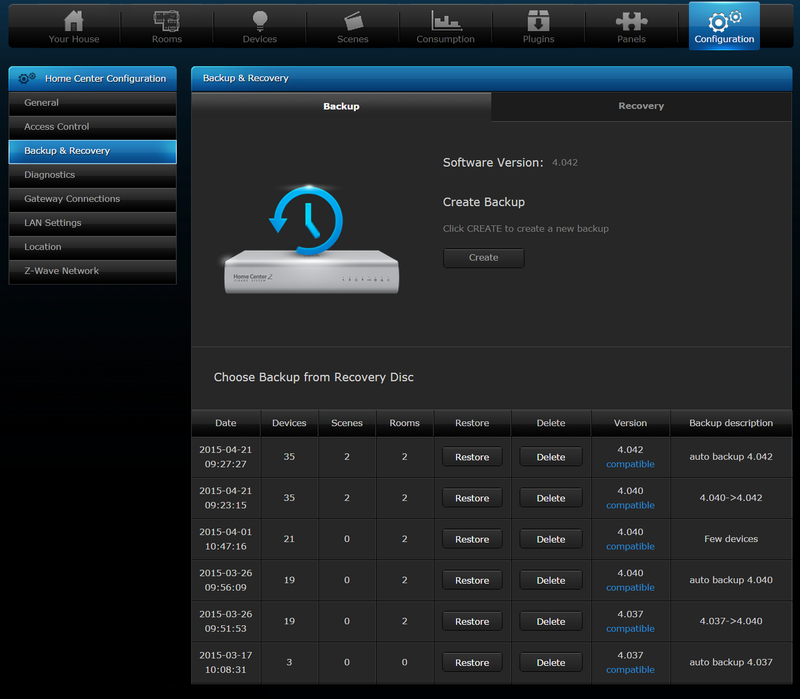 In the Backup window of the Backup & Recovery section the backup files are created and list of them is displayed. Backup file is a copy of a file containing the information’s about all devices added to the system and all of their settings, users individual settings and the HC2 operating system. Diagnostic panel allows to monitor Home Center 2 resources usage, like CPU, RAM memory and storage memory. Z-Wave tab of Diagnostic panel displays if all your Z-Wave devices are configured properly. 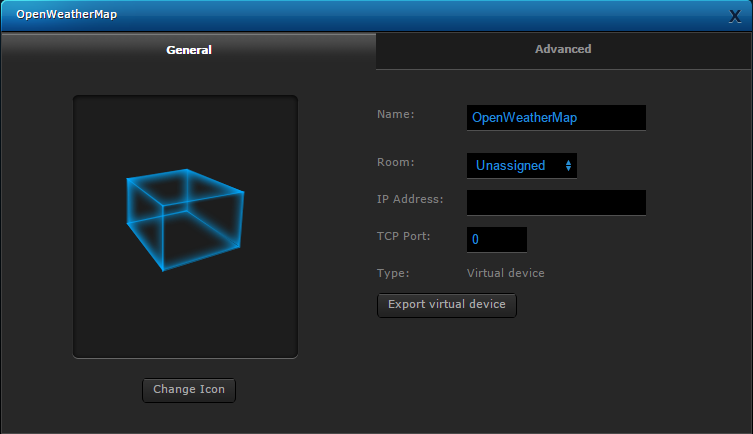 Remote Gateways allow to create large network of home automation. LAN Settings window allows for configuring local network settings HC2 is connected into. Location window includes time, date and format settings. Additionally, it is possible to enter the longitude and latitude or city used for monitoring weather conditions (also used in scenes). 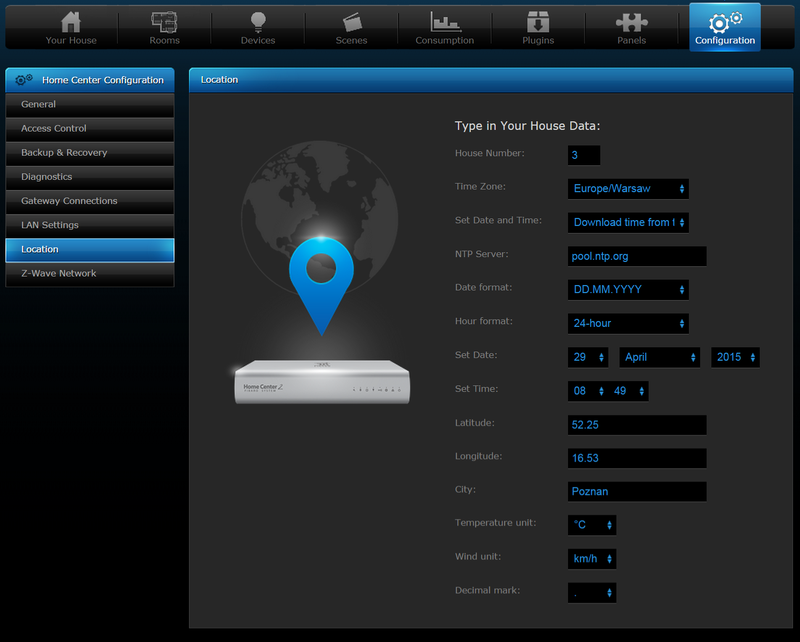 Z-Wave network – in this window the Z-Wave network settings and parameters are displayed. It is recommended to change this settings only by advanced users. Where can I download the FIBARO Home Center app? Will the old application continue to work? The old application will be available for the first half of 2019. After that, the only available and supported application in Google Play and App Store will be the FIBARO Home Center app. 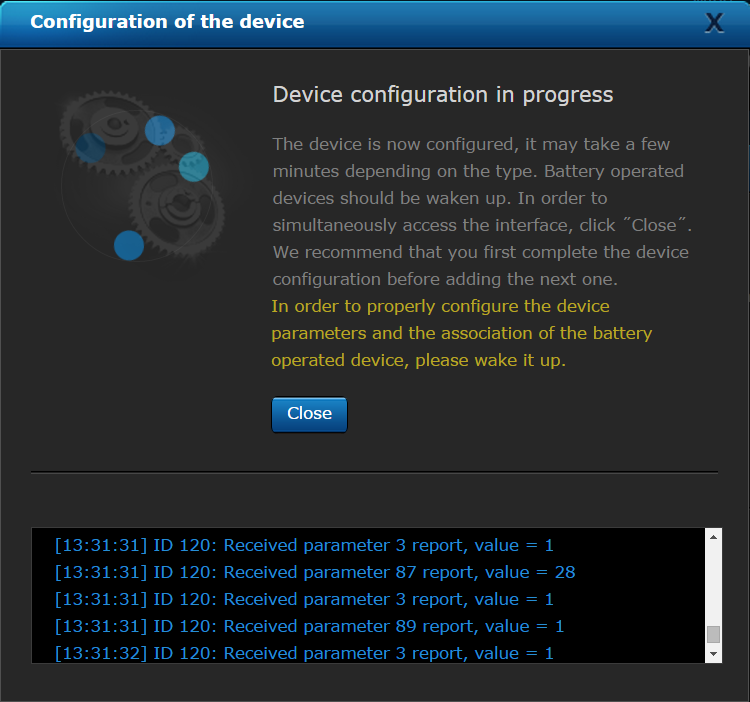 Which gateways and firmware versions the FIBARO Home Center app supports? The FIBARO Home Center app supports Home Center 2 and Home Center Lite gateways with firmware version 4.530 or higher. How to add Siri Shortcuts for iOS? In order to add Siri Shortcuts, use iOS system setting, see official support article from Apple: https://support.apple.com/en-us/HT209055. FIBARO Shortucts work only on iPhone 6s or newer. Should my FIBARO ID login and my local user login be the same? It is required for seamless switching between remote and local access. Make sure not to use the same login for two Home Center accounts! I cannot connect to the gateway. What should I do? For application to work properly, the Home Center gateway must be configured. Update the gateway to the newest firmware. Set location of the gateway. Set name of the gateway. Add at least one room to the gateway. Add at least one device to the gateway. Connect the gateway to FIBARO ID and Remote Access. You can also contact one of our certified installers (see https://www.fibaro.com/en/where-to-buy). I cannot log into the gateway. What should I do? After logging in, I don't see my gateway on the list. What should I do? I see message about Home Center not configured properly. What should I do? I can connect to the app only locally. Check if your FIBARO Home Center is connected to FIBARO ID account. 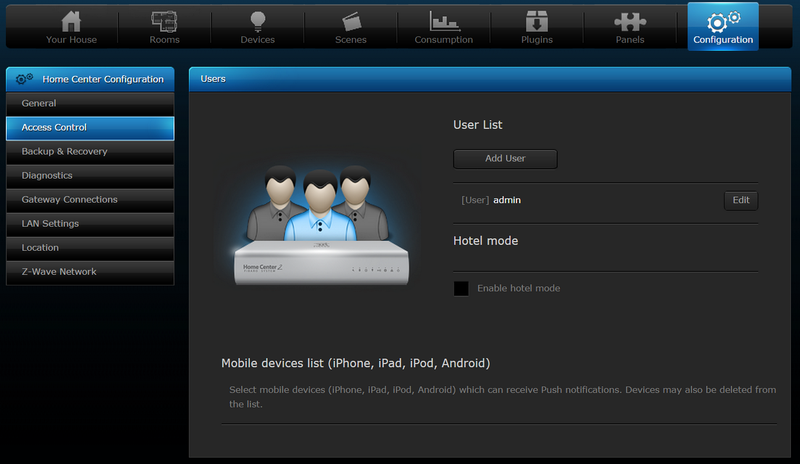 + Login to FIBARO ID account, then go to Remote Access and check if your gateway is on the list. + If you’re seeing “This Home Center is already added to another FIBARO ID account” go to the I cannot add my Home Center to Remote Access. I cannot add my Home Center to Remote Access. Check if your FIBARO Home Center is connected to another FIBARO ID account. + Delete it from FIBARO ID account, if possible. + If you don’t know to which FIBARO ID account it is linked to, or cannot access it, contact our Support Team. After logging to the system, I can’t see the Update button. Certain functionalities are not available through remote access for security reasons. + Log in to your system in local access. I can see 'no internet connection' in mobile app. Your FIBARO Home Center can be offline. + Try to reconnect your FIBARO Home Center. There are problems with the DNS system. + Complete the DNS data in the Home Center interface (Configuration =>LAN Settings) and restart the gateway. The Remote Access is turned off. + Turn on the Remote Access option. 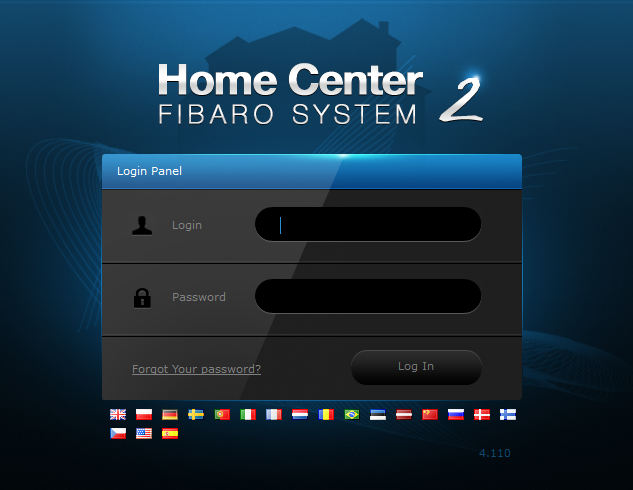 Sign up to the FIBARO ID account and add your FIBARO Home Center to Remote Access. 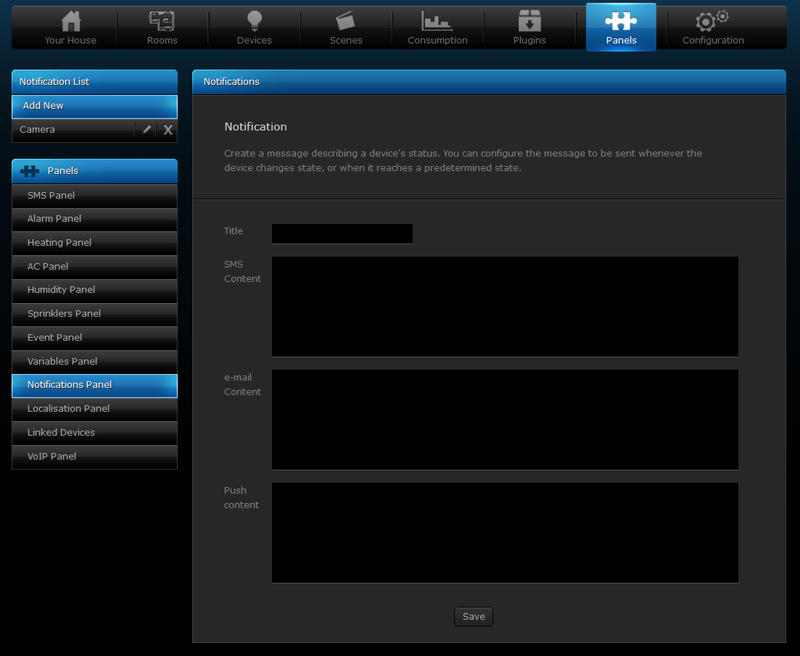 Remote access service is not available in FIBARO ID interface. Probably 22nd port being blocked on the router. + Complete the DNS data in the Home Center interface (Configuration => LAN Settings) and restart the gateway. Internet diode isn’t on – what to do? How to change the Home Center IP address to static or dynamic?